Select the surface of the original to be scanned. Tap this button to scan one side of an original. Tap this button to scan both sides of an original. Tap this button to scan only one side for the first page in the original, and scan both sides of the remaining pages. Change the file name of the scanned original. When sending by E-mail, you can specify the subject and text of the E-mail message and change the sender E-mail address ("From" address). If necessary, change the file name of the scanned original. If necessary, change the subject of the E-mail. If fixed subject phrases are registered, you can select a subject from those registered. If necessary, change the sender E-mail address. In normal circumstances, the E-mail address of the administrator is used as sender E-mail address. If user authentication is installed on this machine, the E-mail address of the login user is used as sender E-mail address. If necessary, change the message text of the E-mail. If fixed message text phrase is registered, you can select message text from those registered. 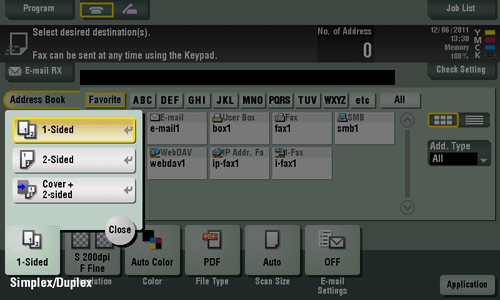 Select the file type used for saving the scanned original data. [PDF]: Most operating systems support this file format. You can specify a password or encrypt the file. Important original data should be saved as a PDF file. [Compact PDF]: Save to a file that has a smaller size than normal PDF format. We recommend this format when you want to reduce file size for sending by E-mail etc. [TIFF]: This is one kind of versatile image formats. This type is available for a multi-page file that provides multiple pages in one file. [JPEG]: A file format widely used in digital cameras. Suitable for saving photo data. This type does not support the saving of multiple pages into one file. [XPS]: A new image file format introduced in Windows Vista. [Compact XPS]: Save to a file that has a smaller size than normal XPS format. [PPTX]: Extension of an XML-base file that is created using PowerPoint of Microsoft Office 2007 or later. Select a unit of pages to be saved in a file if the original contains multiple pages. [Multi Page]: Select this option to convert all pages to a single file. However, if [File Type] is set to [JPEG], you cannot select [Multi Page]. [Page Separation]: Select this option to divide a file into a specified number of pages for transmission using E-mail, SMB, or FTP transmission. 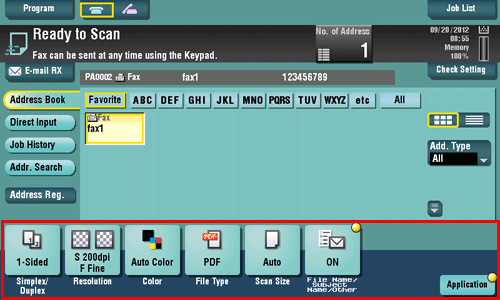 For example, if you enter "2" to scan 10 original pages, the original is divided into five separate files. The specified number of pages is stored and the pages are saved as a single file ([Multi Page]) in a User Box. Pages are converted as a single file by the specified number of pages. 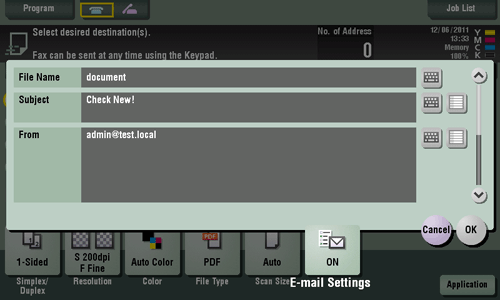 You can select the E-mail attachment method when [Scan Setting] is set to [Page Separation]. [Send All as 1 E-mail]: Attach all files to one E-mail. [1 File per E-Mail]: Attach one file to one E-mail. 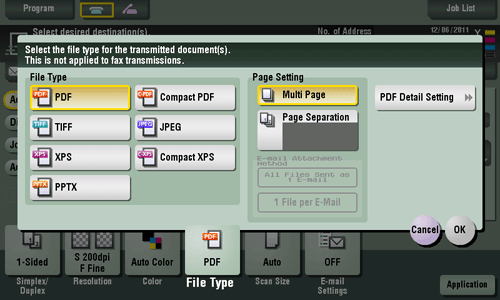 If [PDF] or [Compact PDF] is selected for file format, you can configure the PDF option settings. You can enhance security by attaching a digital signature that identifies the author of the file, by file encryption, etc.